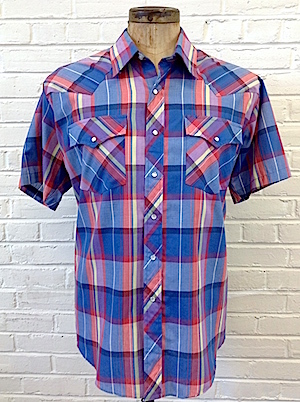 Mens BIG and TALL Vintage short sleeve Western Shirt! 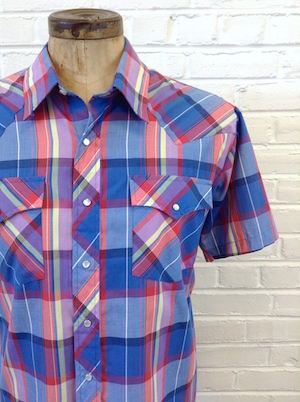 Groovy Pastel-ish plaid pattern with shades of Yellow, Salmon, Purple, Light/Dark Blue and White on the Front, Back and Sleeves. Six Pearly white snaps down the front. Patch Pocket on each chest. Contrast Pattern on Pockets, Placket, Front and Back yoke. Tapered hem. Tag reads Williams Bay. 65%/35% Poly-Cotton.